This triptych of stylistically diverse stories – on the unifying theme of the occult, mysticism and primitive religion – features three equally diverse protagonists: a revered tribal chief whose life depends on concealing signs of age, a debonair daemon suffering professional ennui in a staff training role without prospects, and a visionary moon colonist on the run from unrequited love who is blackmailed into sham psychotherapy and drawn into a bloody labour dispute. This dark triptych of stylistically diverse literary short stories – on the unifying theme of the occult and primitive religion, blending myth and mysticism and mystery – features three diverse protagonists: a tribal chief whose life depends on concealing signs of age, a debonair daemon suffering professional ennui in a staff training role without prospects, and a dystopian moon colonist on the run from unrequited love who is blackmailed into sham psychotherapy and drawn into a bloody labour dispute. ‘Whether it’s a king fighting his descent into middle age, a luckless worker bee stuck on a mining colony in outer space, or a demon smirking at his own wit just to get through another day in the bureaucracy, Ball’s tales examine this futility in all of its subtle horror, sadness, humor, and beauty… Aside from the stories themselves, Savages serves as a display of the versatility in Ball’s writing skills. Diverse as these stories are, Ball’s powerful voice comes through with each. Whenever I read a short story compilation I expect that at least one of the stories will be weaker than the rest, or just plain not fit the author’s style. Not so with Savages. Here, Ball shows off literary agility that most writers would kill for and all readers will enjoy.’ Horror Novel Reviews. ‘…the stuff of which good film adaptations are made. It has elements of romance, rebellion, and a terrible aloneness… In Savages, Ball has accomplished a great deal…showcasing his ability to write in a wide range of voices, each particularly suited to the position of Past/Present/Future and the needed tonal weight of the tale being told.’ Literary Aficionado. ‘…dark, disturbing and deeply thought-provoking. The author’s initial story had me mentally revisiting O’Neill’s classic play, The Emperor Jones. As in that work, the tension and fear in this story is a palpable and pervading presence. The Deposition is a marvelous dark comedy, which reveals even more darkness as one reconsiders it. Lunar Seas builds beautifully from its predecessors. I quickly became involved in Roland’s story and appreciated how Ball mingles the events that led up to Roland’s exile with the account of his stay on the lunar colony. Roland’s commuter romance with Azalea is inspired and will spark fragments of recognition and remembrance in anyone who’s ever commuted to their workplace. The innocence and light of their relationship glow in these dark tales, and somehow brings hope through it all. 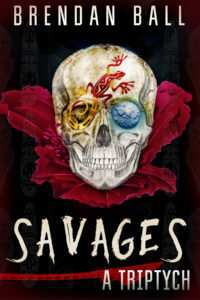 Savages: A Triptych is highly recommended.’ Readers’ Favorite.